Published in the South Kent Gazette, 22 April, 1981. After the dissolution of the Priory, the King- granted the church end the advowson of it to the Archbishop of Canterbury, therefore the Archbishop is really the Rector of it, and he appoints the vicar. The living was regarded as a Perpetual Curacy, to which Archbishop Cranmer parsimoniously granted a yearly pension of £4, and Archbishop Juxon, after the Restoration, granted a further sum of £12 a year, to be paid out of the great tithes. Since then, the living has been augmented, but it is far from being a rich one now. The fact that part of the living comes out of the great tithes gives it somewhat the character of a Rectory, but for many years it was deemed a vicarage. “This small church has a nave, north aisle, and chancel with south aisle, a south porch, and a wooden belfry over the west end.“ These few words indicate two Important differences in the fabric from its present condition. The south aisle was only beside the chancel, and the entrance was by a porch on the south side. A glance at the interior of the building shows that, as regards the south aisle, that must have been so. As the church now stands, the nave has an arcade of six arches on either side. Oil the south side, right up to the pulpit, the arches are all modem, but on the north side there are three old arches which represent the length of the church previous to the enlargement of 1880, while the three corresponding arches on the south side and the aisle south of it must have been added at the restoration of 1851. Sir Stephen Glynne’s statement that one of the old arches was circular does not tally with their present condition, nor does it appear that either of those arches ever was circular or semi-circular. One of the old piers is circular, and probably if the writer had lived to revise the proofs of his notes, he would have so corrected them. On the 8th of May, 1774, the spire of this church was struck by lightning. There was a very thorough restoration and enlargement of this church in 1851, chiefly promoted by the Vicar, the Rev W. Yorick Smythies; the architect being Mr F. R. Wilson, and the builders Messrs W. and G. Denne, of Walmer. There are but scant details left of the actual work done in that restoration. It seems to have been confined to the nave and aisle. The south aisle was lengthened to match the north as it then existed, which involved the demolition of the old south nave wall and the whole west wall. The porch was removed to the north side and the three eastern arches of the nave on the north side were built, the architect following, but not exactly copying the style of the Early English ones then existing on the other side. The three church bells were rehung in a rather ugly stone structure on the new west wall, a new pulpit was installed and the nave and north aisle were reroofed and walls pointed. The aim of the restorers was to give more accommodation, to make the nave loftier, to render the church less damp by slightly raising the floor, and to make the seats all free. The actual expenditure on the church in 1851 does not seem to be left on record. Under another Vicar, the Rev M. Anderson, the chancel was restored and decorated in 1868. Very little structural alteration was made at that time, but the general renovation and decoration of the chancel involved a considerable outlay, in aid of which a grand bazaar was held at the Imperial Hotel (later the Burlington), at which a fashionable set assisted, including Lady North, Mr Ellice, the Misses Fielding, Mrs Churchward, Mrs Anderson, and many others, when more money than was needed for the church was raised, and the balance was given to the National Schools. 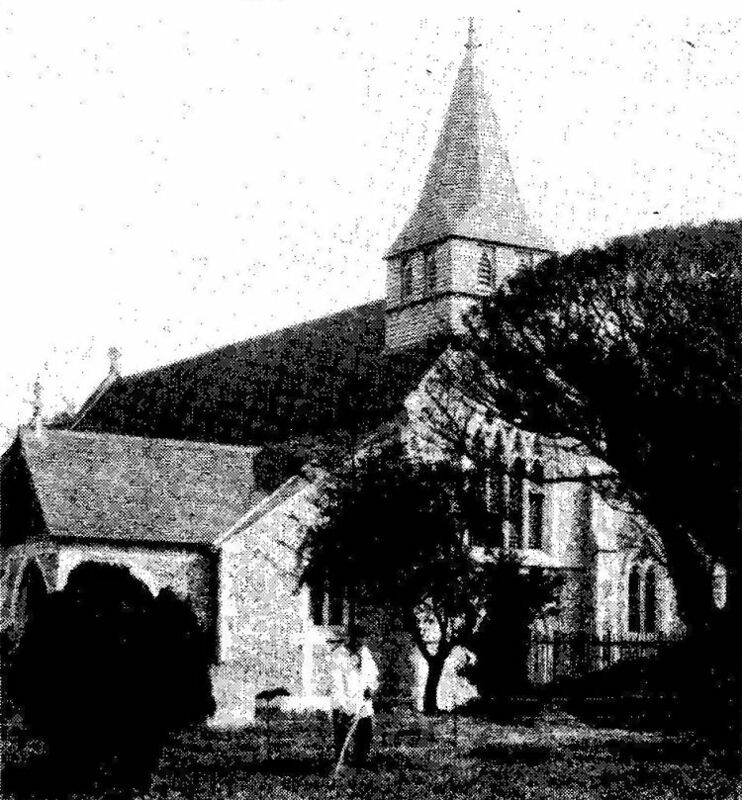 A century-old picture of St. Andrew’s Church, Buckland, probably the last to be taken before the west end, including the bell turret was taken down in order to double the length of the building'. 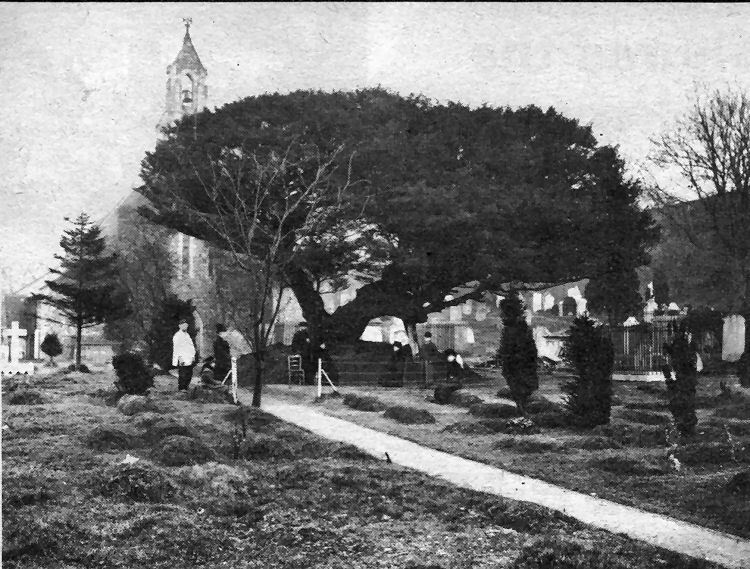 The picture appears to have been taken after the famous yew tree had been moved about 56 feet westwards, an operation which begun on 24th February and was completed on 5th March, 1880. This involved digging under the tree, inserting baulks of timber and then, using rollers, winching the 50 to 60 ton load forward inch by inch along a trench. The fence' beyond which several distinguished looking people posed for this photograph was probably the one behind which spectators stood to watch the operation. They were admitted to the churchyard at a charge of 2/6d (12ip) the cash being used to help meet the costs. Work on extending the church began the same year and the picture above was taken by Martin Jacolette soon after the job was completed.